The presentation contends that attention must be paid to the violent forces of European colonization in the study and teaching of craft. 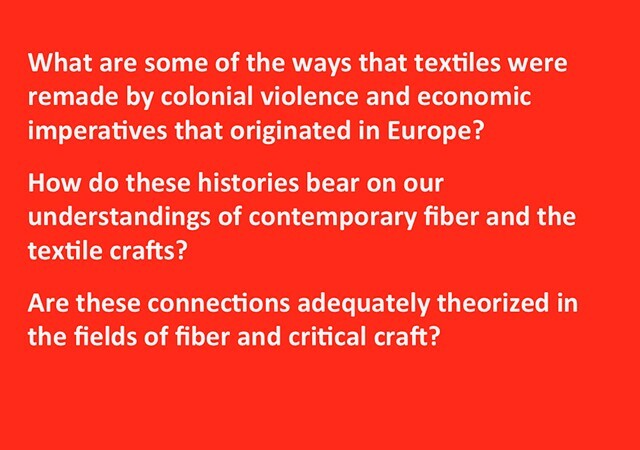 Drawing on scholarship in decolonial, and critical race studies, it proposes that the textile crafts emerged as a result of violent colonization, enslavement, and the plunder of existing resources and production systems  and not industrialization as theorized in canonical texts on craft. It surveys how European colonists seized control of highly sophisticated textile societies and trade routes in Asia, Africa, and the Americas, reconfiguring them to align with European proto-capitalist and proto-industrial commodity systems, gender norms, and divisions of The School of the Art Institute of Chicago, as an example of a more expanded, intersectional, anti-colonial, global, inclusive, and non-hierarchical curriculum in craft and fiber education, and one that both subverts and expands the canons in each field, respectively.